Laura Bland, Tony Cunningham, and Caroline Hornburg, the College of Arts and Letters 3MT Finalists. Two psychology Ph.D. students and one History of Philosophy and Science graduate program student were named finalists in the College of Arts and Letters Three Minute Thesis preliminary competition from a pool of seven competitors. 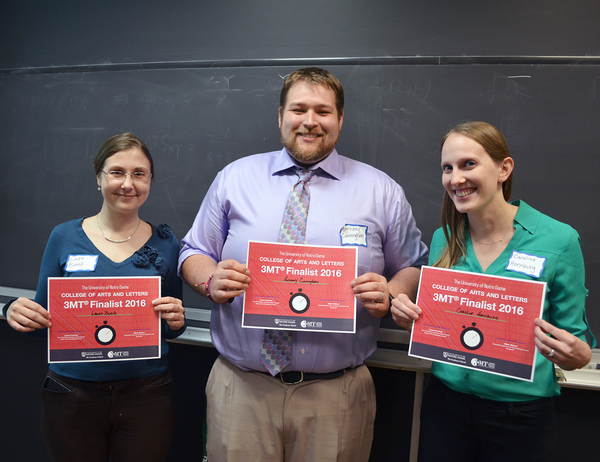 Laura Bland (history and philosophy of science), Tony Cunningham (psychology), and Caroline Hornburg (psychology) advanced to the finals of the competition, hosted by The Graduate School, where they will go up against finalists from the College of Engineering and the College of Science. Graduate students presented on a variety of stimulating and compelling research topics. Maria Ulrickson (history) began the evening with a powerful evocation of injustice in colonial Spanish Santo Domingo, and its contributions to a modern conception of race and overtly racist categories of crime. Nicholas Bonneau (history) recounted in somber detail the death toll in disease-ravaged, pre-revolutionary Rowley, Mass., where in one year more than 188 children died of a throat distemper epidemic. Courtney Smotherman (Ph.D. in Literature program) explored the ways that we write about Italian history when we have no “Italy” to speak of, engaging questions of how writers constructed modern ideas of nation and nationhood. Joel Duncan (English) began his presentation by reciting lines from Walt Whitman’s seminal long poem Leaves of Grass before uncovering the surprising links between nature and industrialization in American poetry. The judges were Mark Schurr, associate dean for the social sciences and research; Michael Desch, professor of political science and director of Notre Dame International Security Center; and the Graduate School’s Sarah Baechle, assistant program director for professional development.